A couple years ago I decided to go through all the cleaning products I use around the house, eliminate as many of them as possible, and find homemade alternatives for those that were necessary to have. Laundry detergent was right at the top of my list of things I wanted to be able to scratch off my shopping list…for good! Homemade laundry detergent is very easy to make and is dirt cheap compared to the store-bought detergents, especially if you buy the brand name stuff. Also, when you make it yourself, you know exactly what’s in it. There are only a few simple ingredients – no fillers or harmful chemicals that commercial detergents contain. There is the added benefit of being able to reuse the container your detergent is stored in, reducing the waste generated by the packaging of store-bought detergent. There are many good recipes online for homemade laundry detergent, most using some variation of borax, washing soda, and liquid or bar soap for the ingredients. Borax and washing soda can be found in the laundry aisle of most stores, and if you can’t find it in stores where you live, you can order it online. 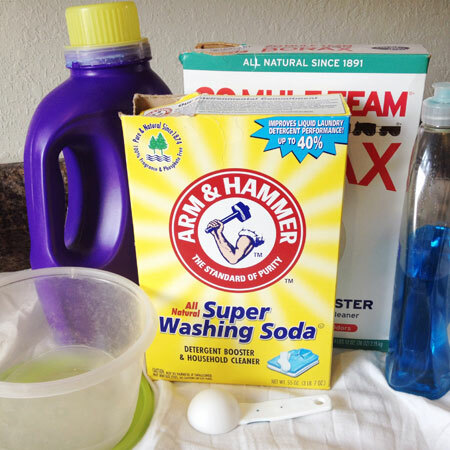 I use 20 Mule Team Borax and Arm & Hammer washing soda. Note: washing soda is not the same as baking soda. The following recipes are the two that I like best after having tried several. I prefer the liquid detergent because it is fast and easy to make, it smells good, and I just like using the liquid more than the powder. 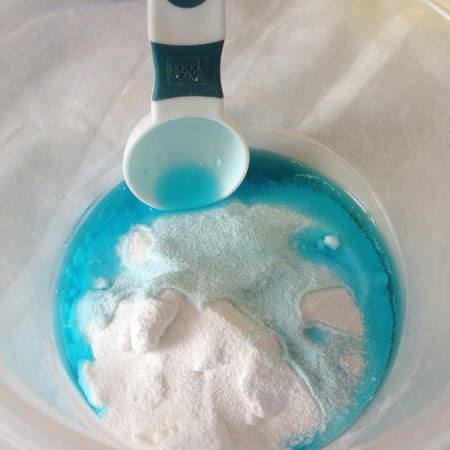 The powder detergent recipe takes a little more time but also works very well and doesn’t take up as much storage space as the liquid detergent. Both of these recipes last for many washes. A little bit goes a long way! 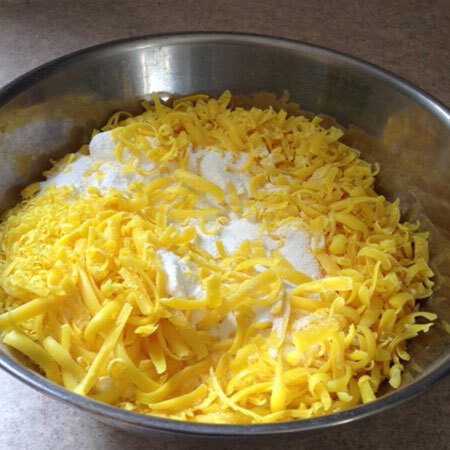 Measure out the ingredients and combine them into a medium-sized bowl. I like to use the blue Dawn dish soap in this recipe, but you can use whatever liquid soap you prefer. I have made this using generic brands of blue dish soap, Dawn Pure Essentials, and orange-scented dish soap. This recipe is pretty flexible, so experiment and see what works best for you. Fill the bowl most of the way with warm water and stir the ingredients to dissolve the borax and washing soda as much as possible. It can take a while to dissolve, so for this step I use a container with a lid so I can just shake it up until the ingredients are thoroughly mixed. 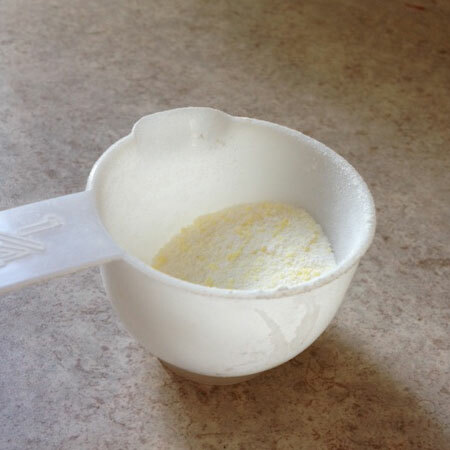 Transfer the liquid mixture to the container you will be storing your detergent in. If the container you’ll be using has a small opening, use a funnel for easier filling. Your container should be gallon-sized or smaller. 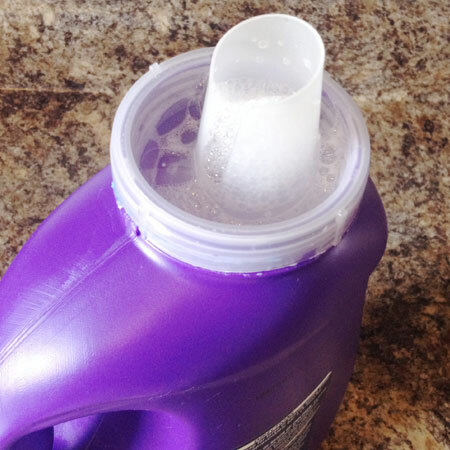 I store my laundry detergent in an old 75-oz laundry soap bottle with a pour spout. Lastly, fill the container almost to the top with water and shake it to mix it up. The amount of detergent you need to use per load will depend partly on what size the container is that you store it in. If using a gallon-sized container, your detergent will be a little more diluted with water, so you will need to use about 1 cup of detergent per large load of laundry. My container is 75 ounces (2.34 quarts) and I’ve found that I only need to use 1/2 cup of detergent per load, which happens to be the exact size of the lid on the container. This recipe is highly adaptable, so if you prefer to use a large container but like your soap to be less diluted, double or triple the recipe, decrease the amount of water, and adjust the amount you use per load accordingly. 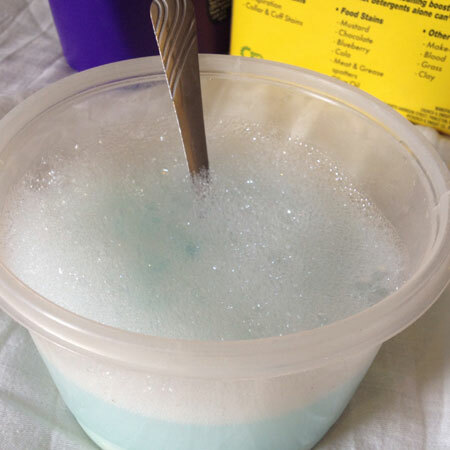 Add the borax and washing soda to a large mixing bowl. 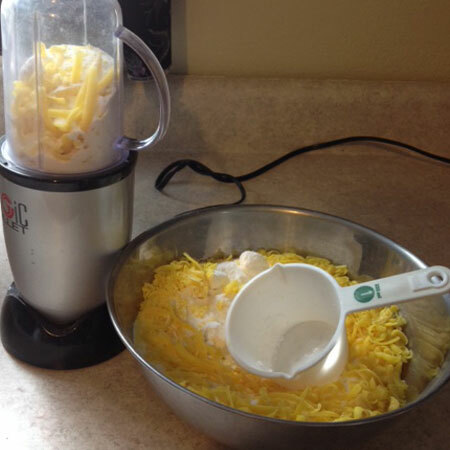 Use a grater or food processor to grate the soap and add it to the powdered mixture. Use a spoon to stir the ingredients together until they are thoroughly mixed. The soap will break down more as you stir (and you could grate it into smaller pieces than what I did here) but I like to do the optional step of running the entire mixture through my food processor to get a nice, fine powder. Transfer the mixture to a container with a tight lid so it stays dry (I use an old coffee can) and it’s ready to use. You only need to use 1 – 2 tablespoons of this mixture per load of laundry, so it lasts a long time! Like the liquid soap, this recipe is pretty flexible. You can use just about any kind of bar soap that you like. 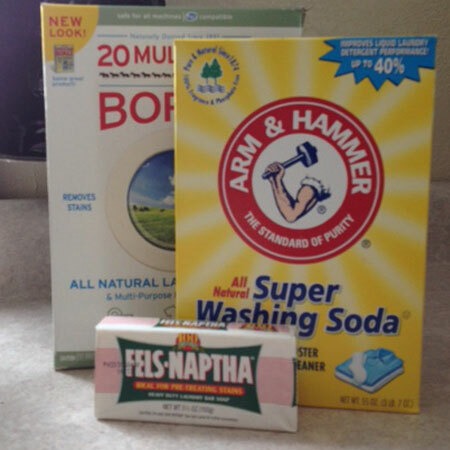 In fact, Fels-Naptha is pretty strong compared to other soaps, so when I use it in this recipe I have found that I can almost double the amount of borax and washing soda with one bar of soap. That’s it! 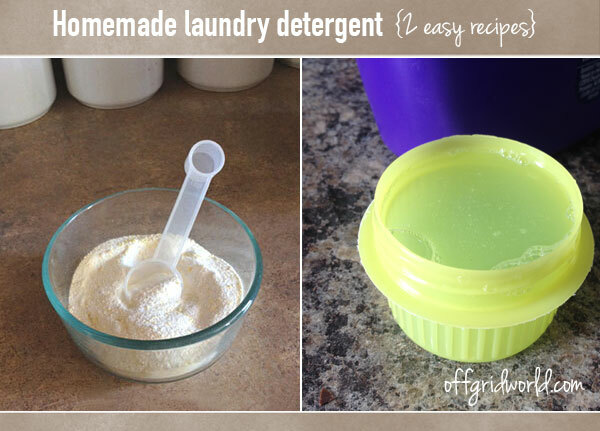 If you haven’t tried making your own laundry detergent yet, give it a shot. I think you’ll be pleased with the results – and so will your wallet!